Augusta, Maine is a world-class capital city where entrepreneurs start, grow, and maintain a variety of businesses. It is full of the best first-rate schools, libraries, and historic and cultural facilities, the Senator Inn & Spa is a great place to stay, relax and enjoy all Augusta has to offer. Both sides of the Kennebec River, along Water Street, and throughout the Capitol complex make up the heart of Maine’s capitol city. Augusta was named after the daughter of General Henry Dearborn, Pamela Augusta Dearborn. 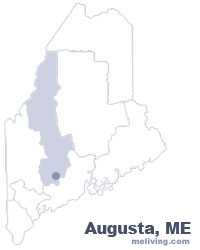 The Kennebec Arsenel is located in Augusta. This collection of buildings is said to be the best-preserved 19th century munitions depot in the nation. The eight granite buildings were constructed from 1828 to 1838 along the Kennebec River. To share any Augusta, Maine information with us, please contact us. Learn more about advertising in MELiving.